As a part of its mission to promote the understanding and appreciation of the Dominican culture, values and heritage, and to create opportunities for discussions of contemporary issues relevant to the Dominican society in the homeland and abroad, GFDD reaches out to the Dominican community living the New York Metro Area and to all those interested in the Dominican culture by organizing ongoing events: Dominican Get-togethers in the Big Apple. 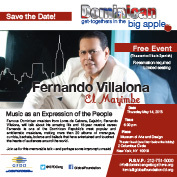 Famous Dominican musician from Loma de Cabrera, Dajabón, Fernando Villalona, will talk about his amazing life and 45-year musical career. Fernando is one of the Dominican Republic’s most popular and emblematic musicians, making more than 20 albums of merengue, cumbia, bachata, boleros and ballads that have entertained and touched the hearts of audiences around the world. Join us for this memorable talk—and perhaps some impromptu music!